Traditions held since our establishment in 1645. ● In 1645 (Year 2 of the Shōhō era) , the Tokugawa Shogunate had come to power, and it was during this period of great prosperity in Edo that Yamasa was founded. It started in a place called Chōshi in Chiba prefecture. Chōshi was cool in summer, warm in winter and this mild climate, together with the high humidity, made it perfect for the growth of the Koji mold, an essential component in the production of soy sauce. It is no coincidence that during the Edo period, Yamasa soy sauce rose in popularity around the same time that the some of the most quintessential Japanese cuisines like sushi, tempura and kabayaki (grilled eel) were created one after the other. 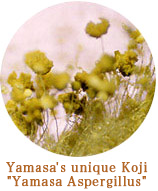 ● One of the things Yamasa is committed to is the Yamasa Aspergillus. The Yamasa Aspergillus is a Koji mold unique to Yamasa that has been passed down since the Edo period and was improved over many years to become what it is today. The reason that Yamasa soy sauce is used in so many high-class Japanese restaurants is because only Yamasa Aspergillus can produce that inimitable color, flavor, and aroma in soy sauce. ● Do you know the meaning of the “上” character that lies on the upper right-hand side of our brand logo? It represents the title of the Highest Grade Soy Sauce, which was granted to Yamasa when its soy sauce was recognized for its high quality by the Tokugawa Shogunate near the end of the Edo period. The 上 character has remained even till today to remind us to make products of good quality. ● We cannot move forward by relying on tradition only. Yamasa established a soy sauce research facility with the purpose of integrating new ideas into old traditions. Up until now, the brewing of soy sauce has been achieved through experience and intuition, but by taking a more scientific approach, we are striving towards the making of an even better product. ● Even while maximizing the strengths of tradition, Yamasa has created products that meet the demands of the times. For example, we are working without delay to create a product that combines the umami of koikuchi soy sauce with the aroma of sashimi soy sauce. Also, we were the first in the industry to adopt organic soy beans as the base for our Marudaizu w/Organic Soybeans Soy Sauce. After that, we continued to expand our organic soybean series with products like our Low Sodium Marudaizu w/Organic Soybeans Soy Sauce and Organic Soy Sauce. Our passion is to pursue the highest safety standards and the ultimate in taste－a pursuit that begins with the selection of the very soil we use to grow our soybeans. ● At Yamasa, we are not only committed in our pursuit of flavor and fine ingredients. There has been a common notion that the dashi (stock) used in tsuyu (dipping sauce) for noodles centers mainly around bonito dashi, with kombu (kelp) dashi being supplementary to that. However, Yamasa has flipped that idea on its head and made kombu the main ingredient in our Kombu Tsuyu. That refined mild taste unique to kombu dashi has helped to produce a flavor that has not been found in tsuyu until now. Our commitment to ingredients and flavor has led to the conception of many new ideas, including the creation of a new flavor in not only our Kombu Tsuyu but also our Kombu Ponzu among others. ● From the time we received the title of Highest Quality Soy Sauce from the Shogunate near the end of the Edo period to this very day, we have not ceased in our pursuit of the highest quality. Through our ISO 9001: 2000 certified system that meets international standards for quality management systems, as well as our traceability system, we continue to safeguard quality from production to store shelves. (*A food traceability system allows customers to track food products as well as information about them, at different stages of the food production process including manufacturing, processing, and distribution, and makes it possible to backtrack through the production process). ● In the 1950s, Yamasa’s research team succeeded in developing the industrial production of 5′-inosinic acid, the flavor component of dried bonito, and 5′-guanylic acid, the flavor component of shiitake mushrooms, using RNA (ribonucleic acid), the origin of life. This was achieved by utilizing our knowledge and experience with microorganisms like the Koji mold used in the brewing of soy sauce. What’s more, by combining these umami components with mono-sodium glutamate, the umami component of kombu, we discovered a synergy of flavor that greatly intensifies the umami taste. Much of what we know about umami was gained through experience in the past, but through our avid commitment to umami, we have also gained a scientific understanding of umami that has become a great contribution to world cuisine. ● RNA and DNA, collectively known as nucleic acids, perform an important role in genetic inheritance and the synthesis of proteins, and are essential components of life. Yamasa has created a new technique in which we use a proprietary enzyme to break down these nucleic acids to create an umami component. Furthermore, with this new technique, we have succeeded in producing many more nucleic acid-related compounds. These compounds have been used to improve the nutritional content of food products, to make medication and diagnostic drugs. Today, Yamasa has been recognized as being top in the world in terms of supply capacity, production technology and quality in the field of nucleic acids. The challenge of producing new scientific techniques, like those in nucleic acid-related science and biotechnology, is yet another commitment of Yamasa’s. ● Soy sauce－the base of Japanese cuisine that has underpinned Japanese food culture－is now being used by people from all over the world. Playing a large part in international cultural food exchange and fusion, it truly is the friendship ambassador of flavor. In 1994, Yamasa built a soy sauce factory in the state of Oregon, USA. From factories like the ones in America and Japan, soy sauce is being exported worldwide and is loved by people from all over the world. ● The diversity in product development, from soy sauce to medicine, is the fruit of Yamasa’s long research into microorganisms, where manufacturing methods utilize the enzymes found in microorganisms. In other words, by harnessing the life force of microorganisms to create products like food and medicine, Yamasa is involved in the industry of life itself. We want to continue to be of service to people’s health, and to be a contribution to society. Yamasa hopes to bring as many satisfied, happy faces, overflowing with vitality, to the dinner table as possible. With this desire and our devotion, Yamasa will continue to move towards the future.